SAYED KHEL, Afghanistan – “It was seven in the morning, and I had not yet started my working day, when Hafsa* was brought to the clinic with normal labour pains,” said Mahbooba, a 27-year-old midwife who runs the Aqtash clinic in Afghanistan’s rural Sayed Khel District. Within a few hours, Hafsa had successfully given birth to a healthy baby, her first child. Everything seemed fine until the new mother suddenly began bleeding uncontrollably and showing signs of shock. Mahmooda was paralyzed with fear. She knew Hafsa’s life was in danger, but did not know how to stop the bleeding. 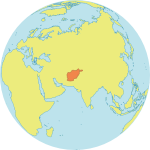 Afghanistan’s maternal mortality rate is the highest in the region. According to a joint United Nations report, women in the country have a 1 in 52 chance of dying from pregnancy-related causes. Other estimates show the risks are even worse: a 2015 survey indicated 1 in 14 women in Afghanistan die of pregnancy-related causes. And the condition Hafsa was experiencing – obstetric haemorrhage – is one of the most common causes of maternal death in the world. Fortunately, Mahmooda remembered the Midwifery Helpline, a toll-free hotline established by UNFPA in November 2016. 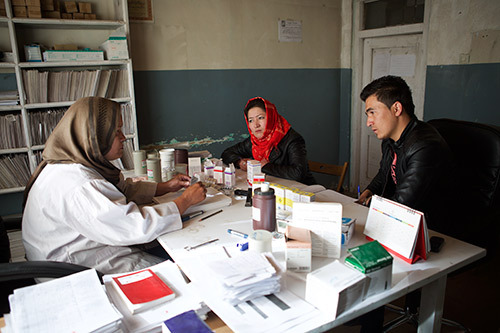 Afghanistan has an enormous need for qualified midwives. The country has only 3.2 nurses or midwives per 10,000 people, according to the World Health Organization. And only recently did Kabul Medical University, with the support of UNFPA, begin to offer a bachelor’s degree in midwifery. Before that, midwives in the country only attended less rigorous training programmes. Making things more difficult, many midwives work in remote clinics, often with little support or entirely alone. The Midwifery Helpline offers much-needed assistance. Dr. Rona Abidi Shayan, a gynaecologist, runs the hotline with three expert midwives. They work in shifts to provide support around the clock, every day of the week. 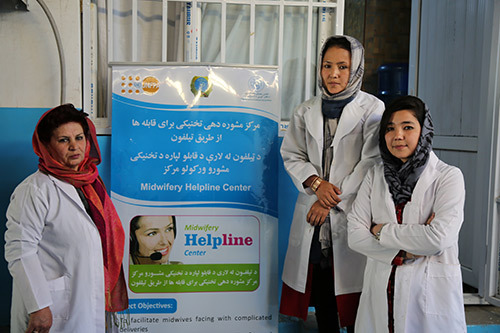 “Midwives call with desperation, and we ensure that they do what is necessary,” said Tahira Nazari, one of the midwives staffing the help line. Sometimes, this means giving life-saving medical advice. Other times, it means seeing if the patient can be referred to a nearby health facility equipped to manage pregnancy complications. Back in the village, Mahmooda was able to call Dr. Shayan, who realized that Hafsa was suffering from uterus atony, a condition that causes dangerous post-partum bleeding. Over the phone, she took Mahmooda through the steps to manage the condition. Mahmooda administered oxytocin and carried out other emergency measures. At the end of a very harrowing phone call, Hafsa’s life was saved. “It is a wonderful feeling to know that, now with the Midwifery Helpline, some preventable labour injuries and maternal and infant deaths can be avoided,” Ms. Nazari told UNFPA. The helpline receives between eight and 25 calls every day, mostly from midwives or doctors handling pregnancy complications. “Usually, I follow up with multiple calls, or sometimes they call back for more advice. I keep following [up] until I ensure the patients are completely well,” said Dr. Shayan. Hafsa is one of those lucky patients. She is now doing well. “Thanks to the midwife and those who helped her over the phone, I have recovered,” she said.